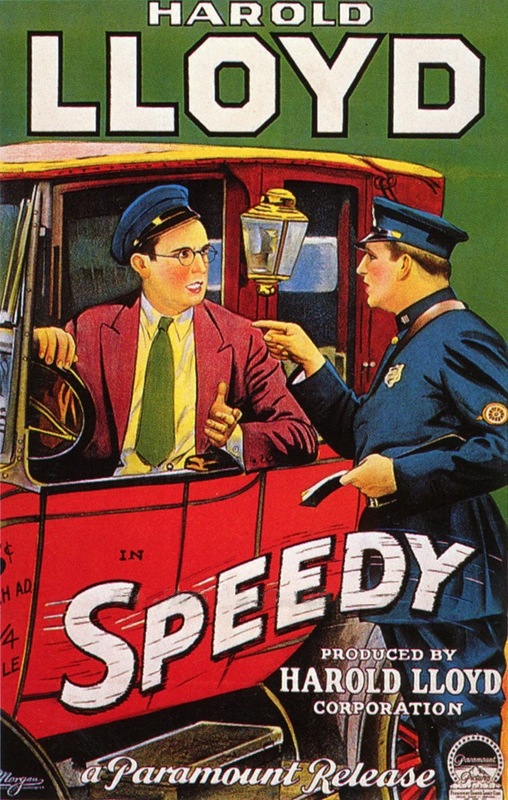 A few weeks ago, I caught a screening of “Speedy,” Harold Lloyd’s last silent film, at Williamsburg, Brooklyn’s Nitehawk Cinema, which has classroom-style desks and table service–during the movie–of cocktails, $9 milkshakes and lime and Thai chili-infused beef jerky, among other choices. Admittedly, what I’ll remember most about the evening is the delightful musical accompaniment by my sister-in-law’s brother’s (Stu Braun’s) band, Daryl Fleming & the Public Domain, which has a rotating lineup of jazz musicians and which has played alongside several other silent film screenings over the past year. The group alternated between improvisation (lots of dissonant rumblings for the suspense/chase scenes, a tad ultramodern for something shot in the 1920s, but stirring nonetheless) and harmonica/guitar renditions of such standards as “Take Me Out to the Ballgame” (there are several scenes shot at Yankee Stadium and a comical cameo from Babe Ruth himself). The drummer was graceful enough to keep the beat while chiming in with a slide whistle to accentuate several moments of goofy slapstick on-screen. Here’s a clip! The film itself, with or without avant-garde music, is worth checking out, and if you haven’t been able to locate it on Netflix, that’s because it’s concealed within The Harold Lloyd Comedy Collection: Vol. 3, which is available for DVD order only. So yes, I’m shamelessly plugging my relative’s band to discuss a movie that is on Netflix, yet deceptively hard to find all the same. So check it out! Surely we can all relate to a schmo with his heart in the right place who keeps botching up odd jobs (soda jerk, delivery boy, driving Babe Ruth to his own game) because of his obsession with major-league baseball. And that’s basically the plot, punctuated by many a Harold Lloyd pratfall, many zingy lines (Lloyd to Babe Ruth, as he drives his cab recklessly, eyes off the road: “Even when you strike out, you miss ’em close!” Ruth’s rejoinder: “I don’t miss ’em half as close as you do!”) and a somewhat sentimental finale in which Lloyd helps save his girlfriend’s father’s horse carriage business from greedy entrepreneurs. There’s a lovely scene in which Lloyd and his sweetheart set up furniture in the back of a moving company truck, as if laying out their own humble abode. They are hiding in the truck to flee from a Coney Island crowd that Lloyd has accidentally angered, via a grabby crab that dropped into his coat pocket. Lloyd, a bespectacled, dapper clown (with his mischievous yet straight-laced face and high-top haircut, you can see how both Steve Allen and the Coen Brothers’ Barton Fink patterned their looks around his), has the energy, comic timing and lack of self-consciousness of all four Marx Brothers rolled into one. “Speedy” is an enchanting good time, so seek out that Volume 3.